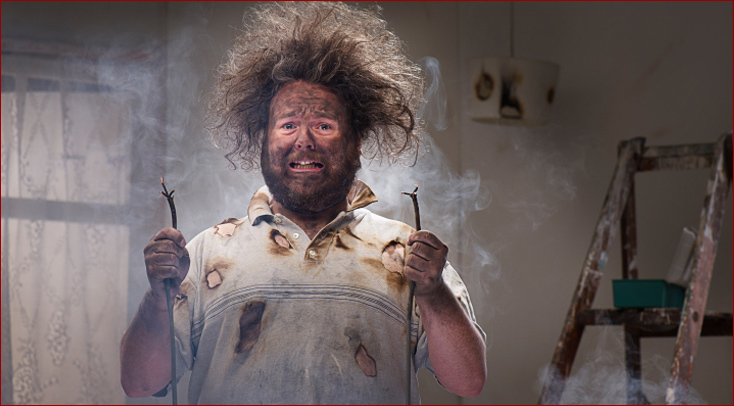 Electrical Wiring – Do NOT Try This at Home! At Least This Guy Survived! Electrical wiring is best left to the professionals. In order to become a licensed electrical contractor in the state of South Carolina, one must meet several qualifications. The first is a minimum of two years experience under the supervision of a licensed electrician. Secondly, one must pass the master electrical exam and business exam: 80 questions, four hour time limit-50 questions, 3 hour time limit, respectively. Which means that you have about three minutes per question. Thirdly, once the exam have been passed, (most don’t make it this far!) you must submit your application to the state for an electrical contractor’s license. Oh, and you must complete the Code of Laws Take Home exam, 40 questions, and submit it with your application. Lastly, one should obtain a minimum one million dollar liability insurance policy, just in case. Fees, I almost forgot the fees, about $700 in fees just to get started. Why is it so hard to get an electrical license? The reason is to protect you! Electrical contractors are held to a high standard of professionalism. Our work is subject to inspection by officials that are employed by the jurisdictions in which we work. We have a code that we are required to follow, the National Electrical Code, an 870 page book of regulations that is updated every three years. The purpose of the Code is: Article 90-Practical Safeguarding. The purpose of this Code is the practical safeguarding of persons and property from the hazards arising from the use of electricity. Do yourself a favor, the next time you need some electrical work done don’t call your brother-in-law because he once hung his own ceiling fan, call a professional. And, by the way, when you get the bill, try to remember what I’ve said about the journey to be an electrical contractor. Your electrical contractor has invested literally thousands of dollars into becoming the professional that you want working in your home. Come see us at York Tech, and we can teach you to do it the right way! Or call us at (803) 981-7755.